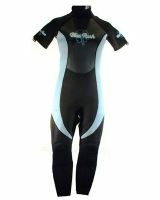 The wetsuit can be worn with or without the easily detachable sleeves. Wearing this style of wetsuit the user can accommodate varying weather/water conditions and also enjoy greater flexibility as and when required for sports that require greater upper body flexibility, for example swimming or kayaking. Blue Rush wetsuits use a combination of 1/2 mesh and double lined high quality titanium neoprene with a fine quality nylon on the double lined finish. The 1/2 mesh is on the front panel and back kidney panels for added warmth, the knee area also has additional Toughtex pretection to prevent wear. We use compression flat lock stitching on the seams for added strength and all our wetsuits feature Y.K.K. zips for extra strength, tucked away on the inside zip seam is a convenient key pocket.